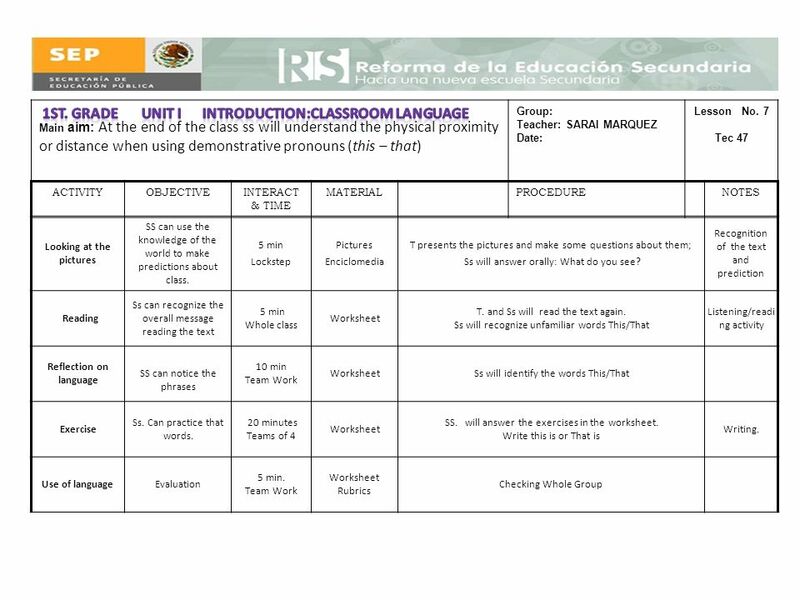 Main aim: To provide student with some basic classroom language that will enable her/him to communicate in English at all times during her/his foreign. 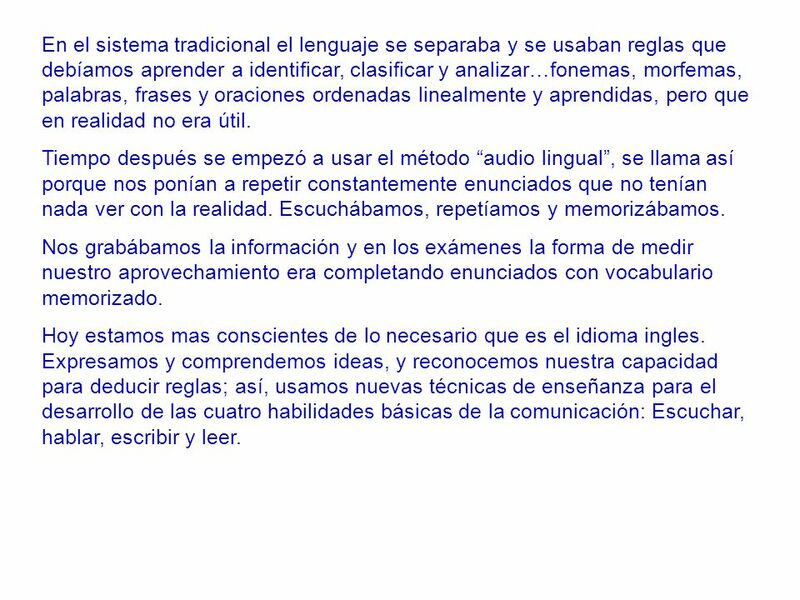 3 En el sistema tradicional el lenguaje se separaba y se usaban reglas que debíamos aprender a identificar, clasificar y analizar…fonemas, morfemas, palabras, frases y oraciones ordenadas linealmente y aprendidas, pero que en realidad no era útil. Tiempo después se empezó a usar el método audio lingual, se llama así porque nos ponían a repetir constantemente enunciados que no tenían nada ver con la realidad. Escuchábamos, repetíamos y memorizábamos. 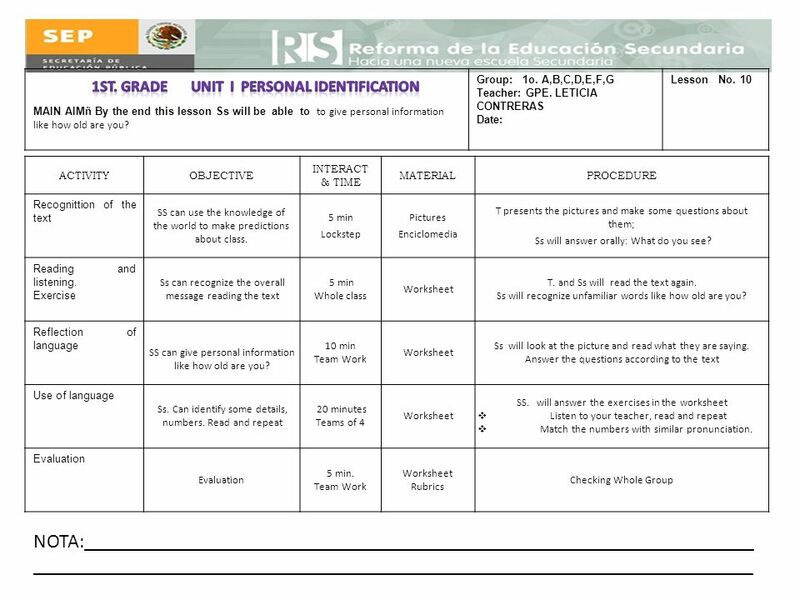 Nos grabábamos la información y en los exámenes la forma de medir nuestro aprovechamiento era completando enunciados con vocabulario memorizado. Hoy estamos mas conscientes de lo necesario que es el idioma ingles. 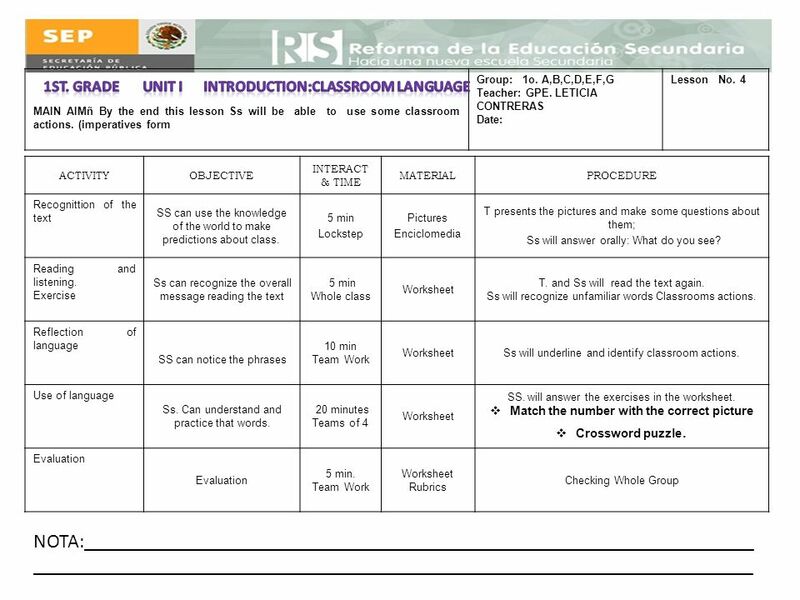 Expresamos y comprendemos ideas, y reconocemos nuestra capacidad para deducir reglas; así, usamos nuevas técnicas de enseñanza para el desarrollo de las cuatro habilidades básicas de la comunicación: Escuchar, hablar, escribir y leer. 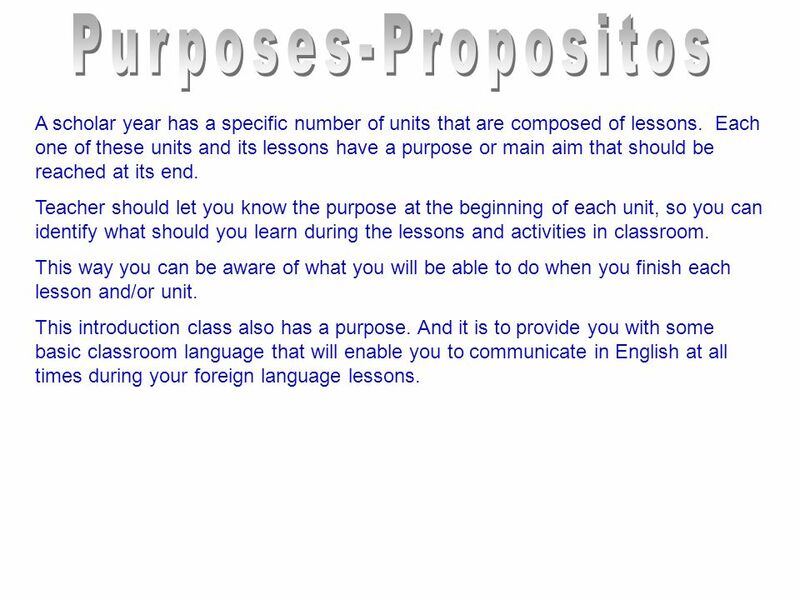 4 A scholar year has a specific number of units that are composed of lessons. 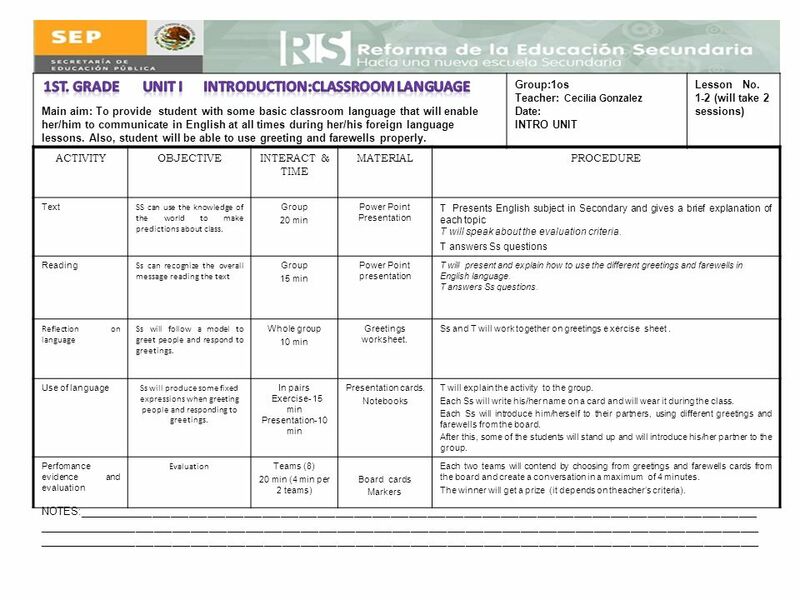 Each one of these units and its lessons have a purpose or main aim that should be reached at its end. 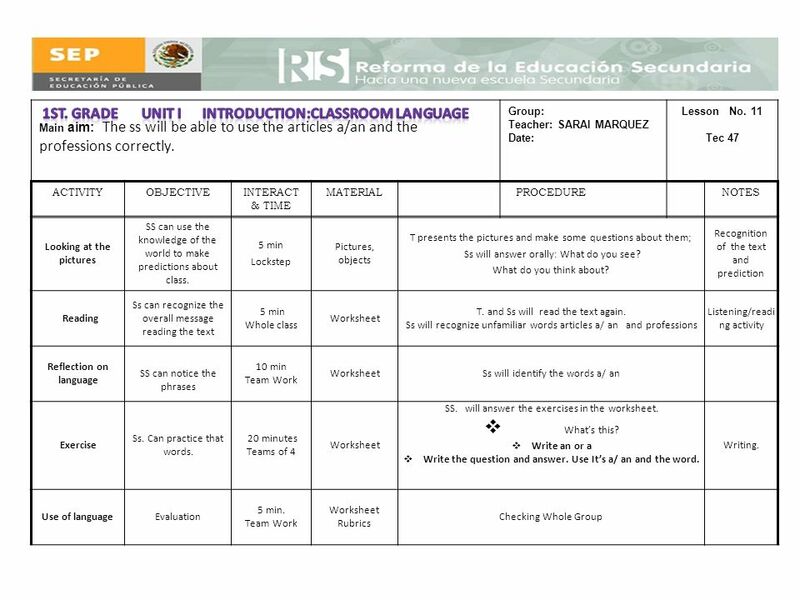 Teacher should let you know the purpose at the beginning of each unit, so you can identify what should you learn during the lessons and activities in classroom. 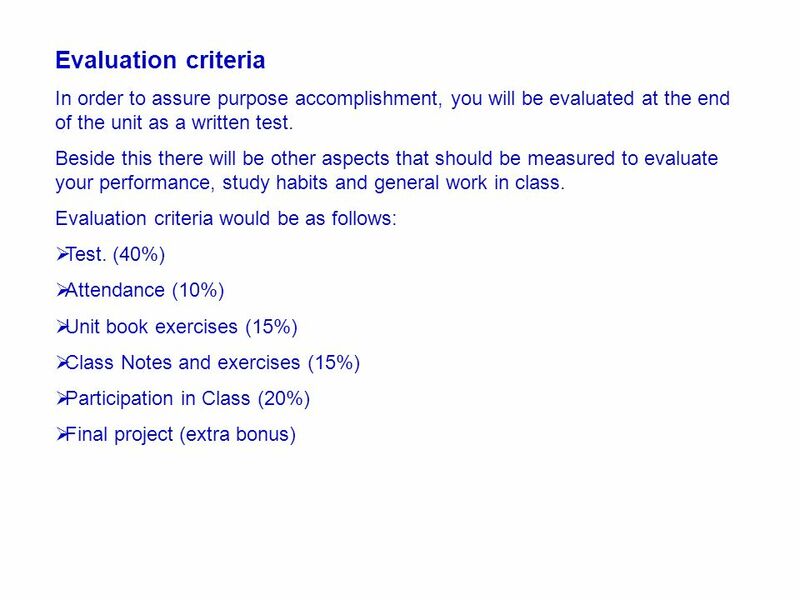 This way you can be aware of what you will be able to do when you finish each lesson and/or unit. This introduction class also has a purpose. 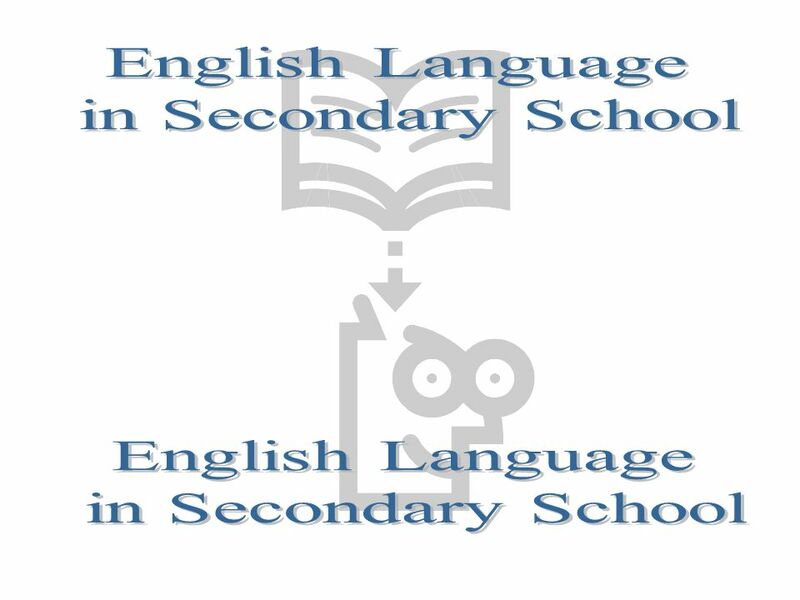 And it is to provide you with some basic classroom language that will enable you to communicate in English at all times during your foreign language lessons. 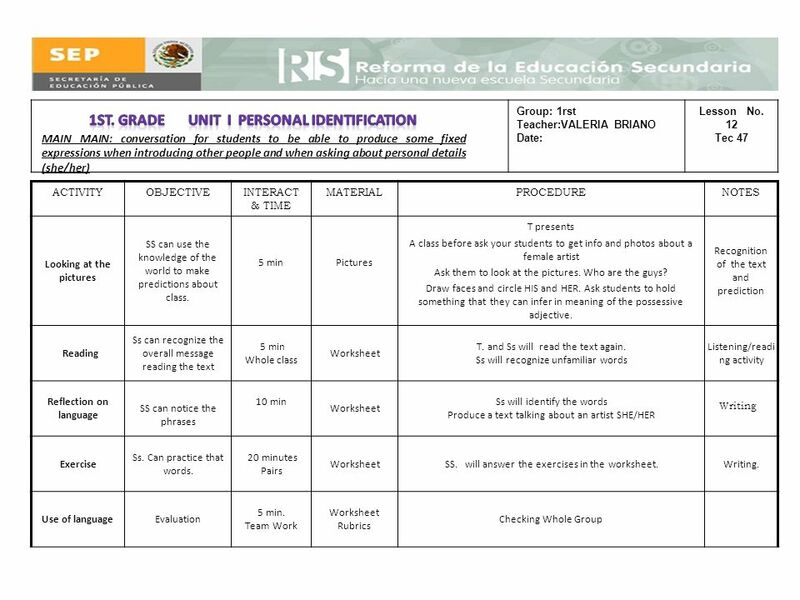 6 First year includes five units and their purposes are: 1st-Personal identification. To enable you to introduce yourselves and others, and to exchange personal details. 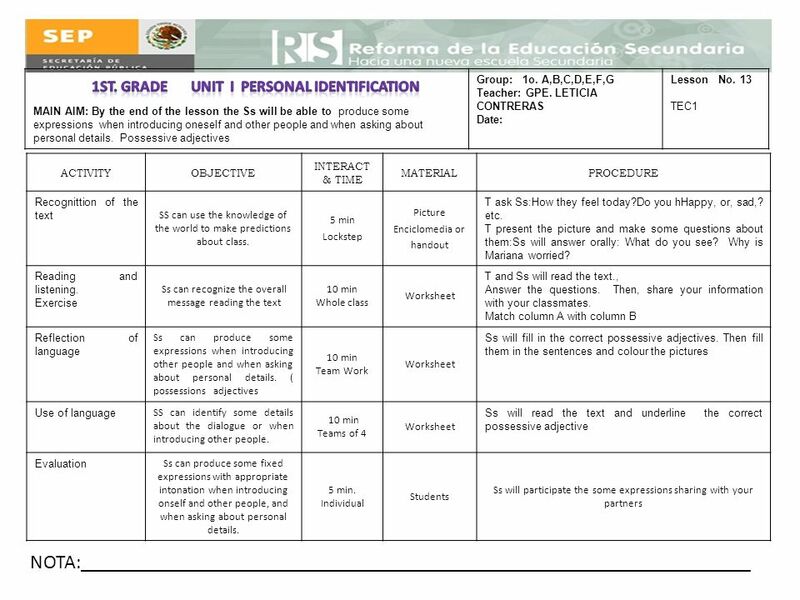 2 nd -Actions in progress To enable you to give and obtain information about possessions and to describe actions there are in progress at the moment of speaking. 3rd-Hobbies, leisure and sport. To enable you to express your personal interests around the topic of hobbies, leisure and sport, and to make/respond to invitations to events/places related to the topic. 4 th -Daily life To enable you to describe actions that happen daily or periodically in your life or in the lives of people and animals they are interested in. 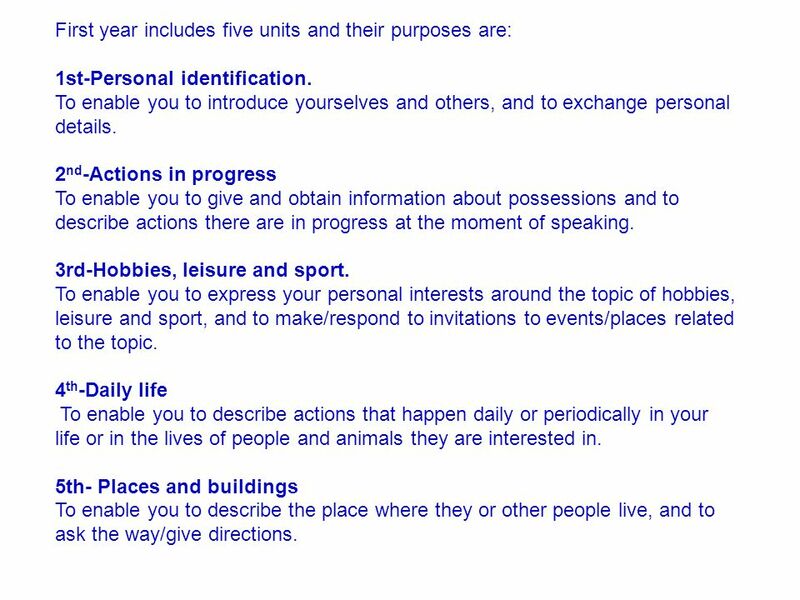 5th- Places and buildings To enable you to describe the place where they or other people live, and to ask the way/give directions. 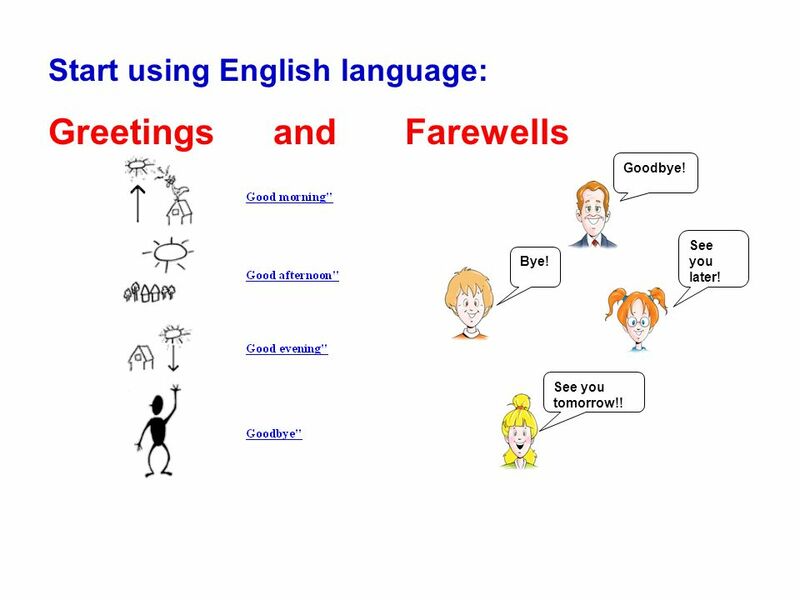 7 Start using English language: Greetings and Farewells Goodbye! Bye! See you later! See you tomorrow!! 9 Greetings Hello, …/ Hi, … Good morning/ afternoon/ evening. How are you? - Fine, thanks. And you? How have you been? - Very well. And you? Good/ Nice to see you again. Introducing oneself Can/ May I introduce myself? My names Peter. Let me introduce myself. My names …. Id like to introduce myself. Im Good-byes Good bye/ Bye/ Ill say good bye/ See you later/ See you soon. I must go now. To be placed on the board by separately! 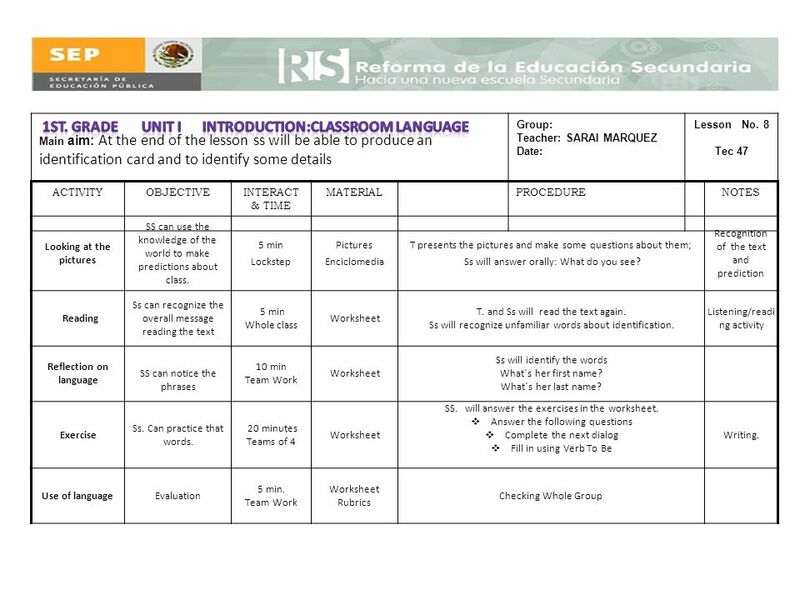 Download ppt "Main aim: To provide student with some basic classroom language that will enable her/him to communicate in English at all times during her/his foreign." When you finish, study once more for the chapter test. 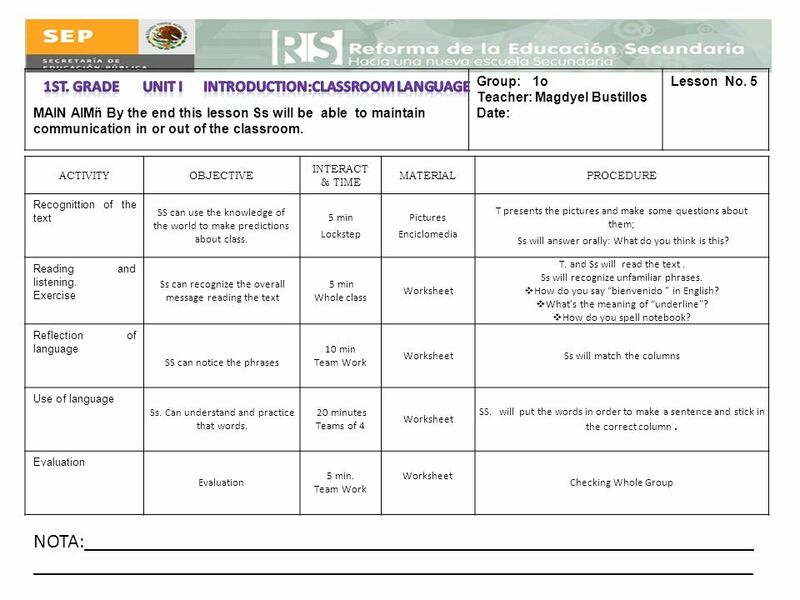 Purpose To create the distribution of contents from the unit three. 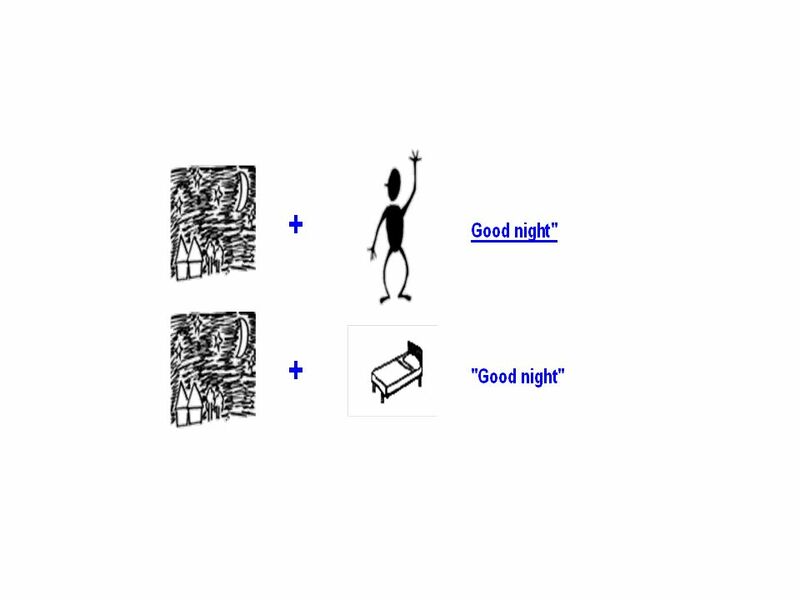 TIENEN 5 MINUTOS Objective: I can describe the weather and use it in speaking and writing prompts Vocab/Ideas: Weather (review) Vámonos: Translate the. 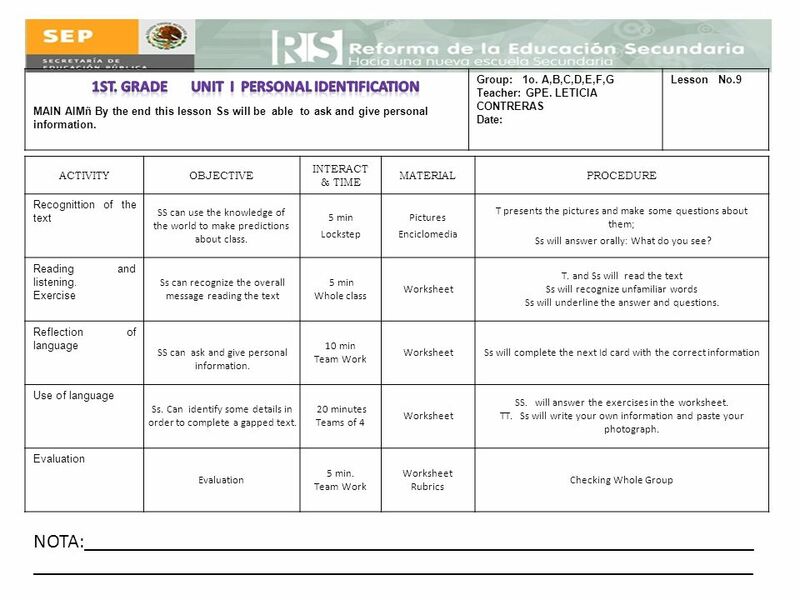 Unit 1 Personal Information  General objectives:  Students will be able to look for friends according to personal information.  Students will be able. 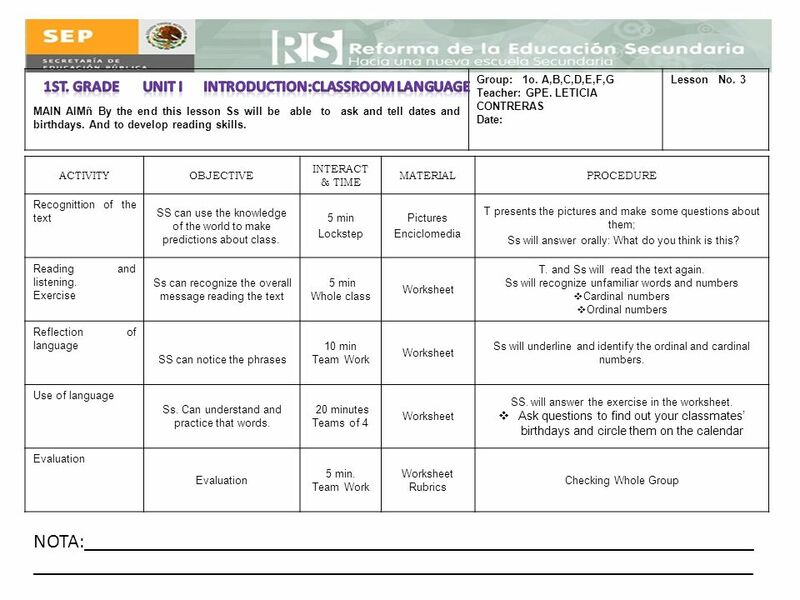 Spanish Lesson Plan L. P. Miles Intermediate Grade Level: 5 th Unit: Emotions, Calendar, Numbers (15-30), and Weather Teacher: Mrs. Marcia Leal General. ATTENTION LANGUAGE LEARNERS ! THE SENIORS’ GUIDE FOR SUCCESS. 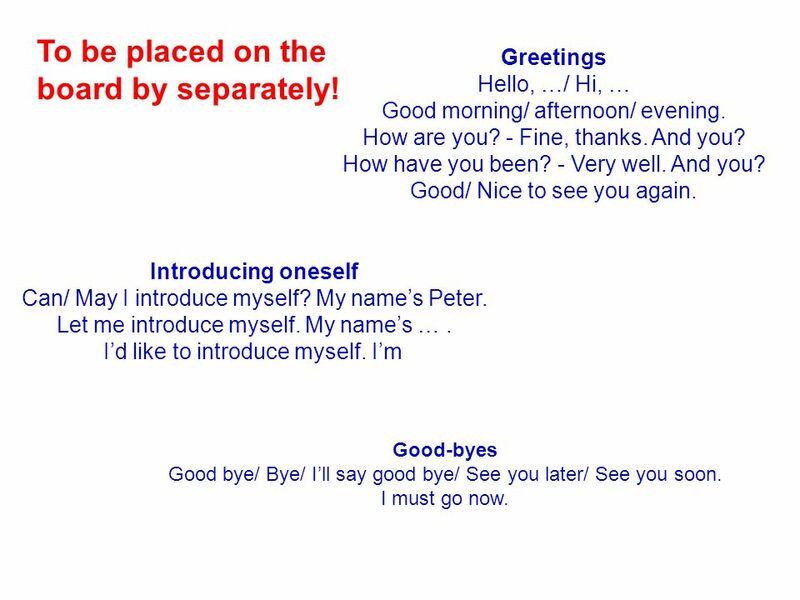 Lesson 4 Making Telephone Calls Business English Conversation & Listening Instructor: Hsin-Hsin Cindy Lee, PhD. Overview of Standards for Literacy in History/Social Studies, Science, and Technical Subjects The Common Core State Standards.